This is a night I’ll remember for the rest of my life; that’s pretty obvious! The whole night couldn’t have gone any better. We had a great start to the game, but we were feeling good the whole day. We felt good coming to the rink, and being able to get some early momentum made a huge difference for us. As the game went on, we knew we were getting closer and closer to that gold. David and the guys are a great, great team, and everybody can have a night like that. We certainly have had our share over the years, but I have a ton of respect for those guys and we were honoured to be on the podium with them and Niklas’s team from Sweden. The team celebrates its victory over Great Britain. I can’t tell you what a thrill the past year has been. 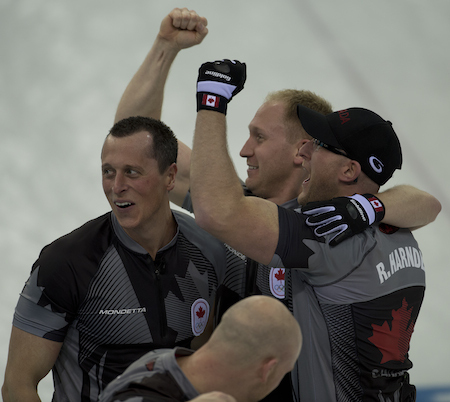 To win the Brier, then the Trials and now the Olympics — it just seems amazing. And I couldn’t have asked for a better group of guys to do it with. I grew up around my cousins E.J. and Ryan Harnden, and Ryan Fry has become one of the family. We’re great teammates and great friends, and it felt great to share this experience with them. Our coach Tom Coulterman has been so good with us over the years. It’s not easy being a coach, especially when they don’t get Olympic medals. But Tom knows how much he means to us, and we’re thrilled for him to get some recognition here in Sochi. We got a chance to work with the national team coach Rick Lang at the world championship last year in Victoria. It was a good fit right away. Rick has some amazing knowledge of curling, and as a Thunder Bay guy, he knows what makes us Northern Ontario boys tick! 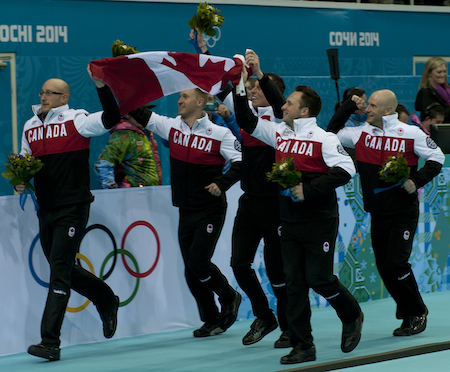 The victory lap in Sochi! We got a chance to have a victory lap with the Canadian flag tonight after the game, and that was something I’ll always remember. We’re all proud Canadians, and having a chance to show our love for the country with all of our friends and family cheering in the stands was pretty cool. My parents weren’t able to make the trip to Sochi, so I was really thinking of them back home. I know they were watching the game. And being able to have my wife here with me tonight was very, very special, and I know the guys were feeling the same way about their own families. A lot of years from now, I’ll look back on Sochi and I know I’ll still get chills. From start to finish, this was the experience of a lifetime. The organizers did a wonderful job in putting on the Games, and I can’t thank them enough. Same with the people at the CCA, who have supported us on our climb to get to this point. 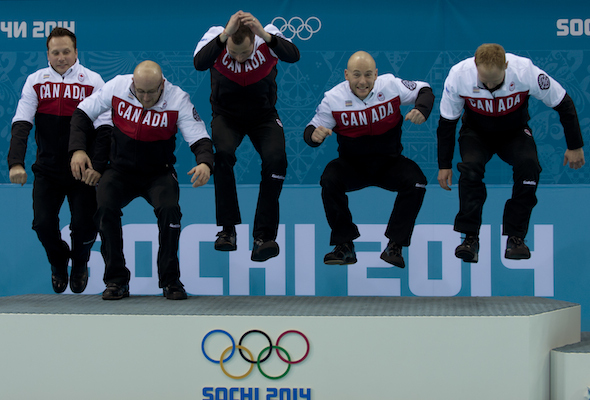 We still have the medal ceremony to look forward to tomorrow night, and then the closing ceremonies on Sunday. Then the long flight home, and I know the people in the Soo will be there to welcome us home. We can’t wait! Thanks to everybody across the country for their support and good wishes!